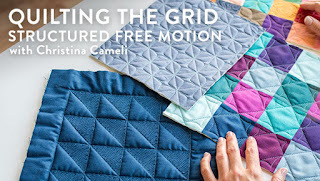 Way back when I learned I was getting an Accuquilt GO! cutter, I also learned I could choose three dies to go with it. I took that decision very seriously. Like, obsessing about it for two weeks seriously. I even woke up once in the middle of the night thinking about it. No joke. 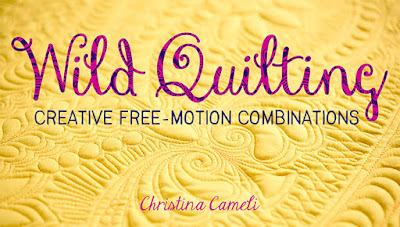 Mostly this problem occurred because I am a weirdo, but I also had a hard time figuring out from the Accuquilt site how their dies fit together. 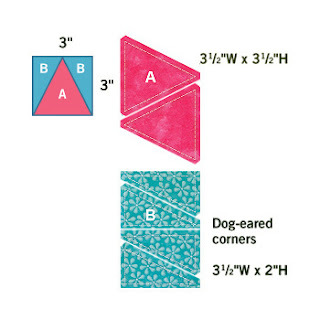 For instance, with the chisel die they tell you that another die will finish the shape out to a rectangle, but is there a triangle that you can sew to the shorter side to finish it out to a half square triangle? They don't say, and their information about the shape doesn't give you the height of the short side, so you can't even go researching their other triangles. Trying to figure that kind of stuff out took way too much time and energy. Finally, after I woke up thinking about it in the middle of the night, I just made myself decide. My first decision: no strips and no squares. I occasionally do bonehead things with my rotary cutter but can generally be counted upon to manage these straightforward tasks. So, angles and curves only. Yes, I know I could do these things with my rotary cutter too. But, let's face it: I'm lazy and I probably won't. I chose the triangle in a square. It seemed versatile. And the isosceles triangle. I like the idea of making a kaleidoscope quilt. I also chose the 7 inch drunkard's path. I read Heather's review and got excited about the little notches to help you match the curves up. I'm kind of impressionable. While waiting for the Accuquilt GO! to arrive, I tried to figure out what I was getting into. 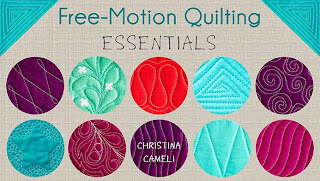 I watched some of Accuquilt's YouTube videos. They cleared up the general confusion I had about how the cutter worked. The one video that stuck with me was "Lee's Stripper Tips" (you can see why I had to click on that one). I dare you not to laugh while watching this. When the box was delivered I busted it out right away, and grabbed some scrap fabric to try it out. When I unwrapped the dies they looked like big pieces of dense dark foam. The blades are under the foam. I followed a tip I saw on SewCalGal about marking the cutting lines with a silver sharpie, making them easier to see. I also used the sharpie to mark the size of fabric piece necessary to make the cut, so I wouldn't need to remeasure it every time I went back to use the die. I tried the cutter out like I'd seen in the videos. You make a "fabric sandwich" with the die underneath the fabric and a cutting mat on top. 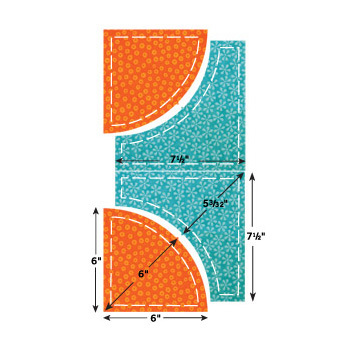 As the sandwich moves under the rollers, the blades are pressed through the foam in the die and cut the fabric against the cutting mat, upside down compared to how you use your rotary cutter. The dies are supposed to last, but the cutting mats will give out eventually from repetitive cuts. When you run the die through the cutter it leaves cuts in the mat each time. Reading the instructions I learned that for accurate cuts you are supposed to feed the fabric through the cutter along the lengthwise grain. 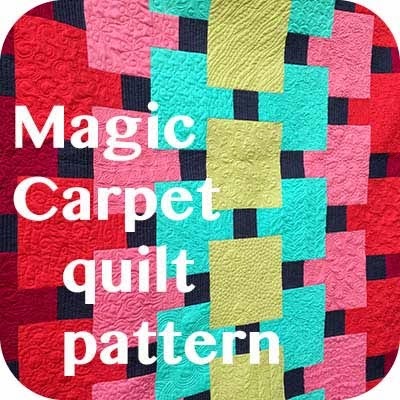 If you are working with a scrap and you don't know which is the lengthwise grain, Accuquilt has some tip about how to yank on your fabric and listen to which direction makes a higher pitched sound. This totally cracked me up. My rotary cutter does not ask me to listen to my fabric! 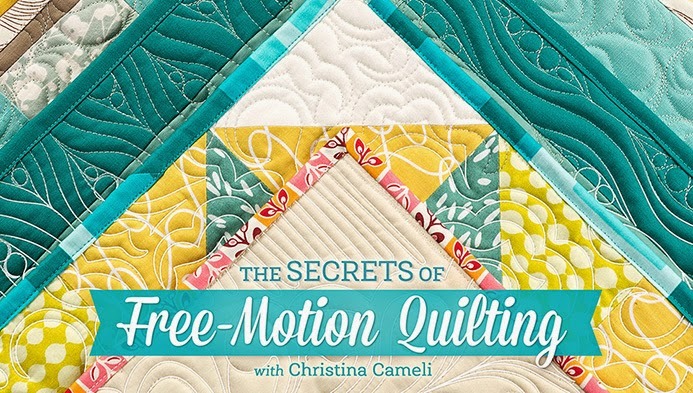 I have a lot of scraps and I am not really into precision piecing so I decided I would probably ignore this advice, for my sanity. I loved that I could cut fabric with my toddler crawling all over me and the cutter without anyone getting hurt. But the first few times I tried to pass a die through the cutter I couldn't get it to go through and I honestly thought it was broken. It took more strength than I expected to get the die to catch under the rollers. Soon I figured it out and after a few cuts I felt familiar with the routine. So I embarked upon my bunting quilt. And that's what I'll show you next time! I have used the fabric "pop test" for figuring out the grain a few times. It really works. I have gotten Fat Quarters with no selvedge (yikes) so there you really need to know. My sanity didn't change with that, I am as sane/insane as ever. I was not surprised that it took a little oomph to crank the handle. Having used other machines thru the years for various jobs, it was about what I expected. Can't wait to see that bunting quilt. Thanks for sharing your impressions about the Go cutter. I've got one, but only the value die that comes with it. I'm saving up for some dies I want - my criteria is that the dies be for things I can't cut easily with my rotary cutter, like the drunkard's path, or the tumbler die. 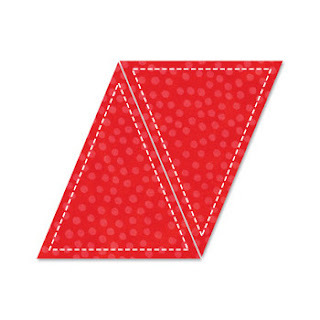 Can't wait to see your bunting quilt! Christina, I think you made good choices. I am so jealous that you got one of these cutters! I'm thinking about the baby one, but I till can't always figure out which dies would work and which ones wouldn't. Like you, I'd choose the harder angles to cut. 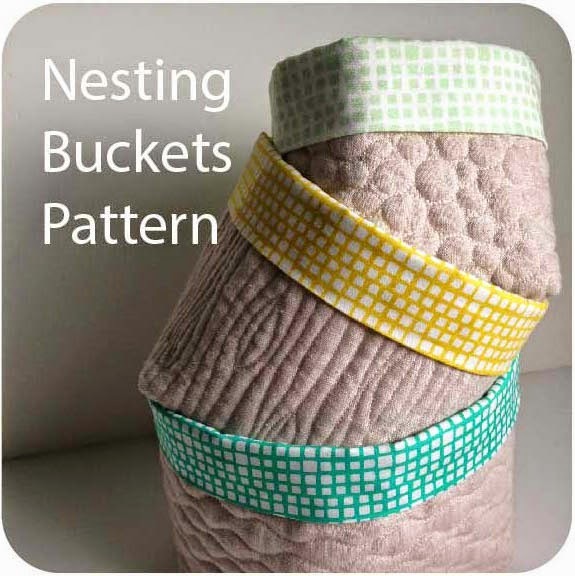 I think the hexagons would be great for doing hexie quilts. Drukard's path also. And kaleidoscope....brilliant. I would also like the strip ones at some point, just for faster, more accurate strip cuts. But they'd be lower priority for me. Can't wait to see what else you are working on! Sounds like you made some great choices. 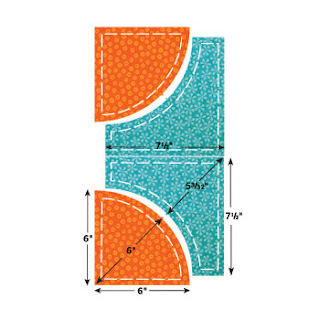 I just bought the Sizzix Big Shot and only bought dies that aren't easy to cut also. Thanks for the great tip about using a silver sharpie, I'm definitely going to do that. Christina, I like your choices. 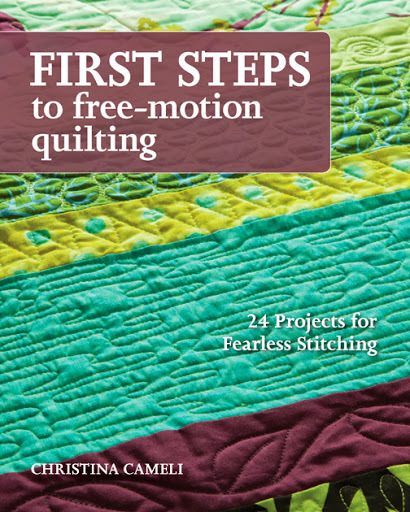 I just got an AccuQuilt GO! also but I went with the strip cutters, 1.5" and 2.5". Like you I thought that I could cut the straight cuts just as easily with a rotary cutter, but after watching some of the videos on YouTube I realized just how handy the strip cutters are. Could cut a king-size log cabin in an hour! Have fun with your GO! All good to know - thanks for the post. I have had mine for a couple months and have yet to try it out - yes it's true. So i'll be looking forward to your next post. Ah, such a fun toy! I wish I had one, but alas... so in the meantime I'll live vicariously through you!